The Code & Go Robot Mouse activity set is an all inclusive kit for primary aged kids (ages 5 - 9) to learn basic coding concepts and develop logical thinking skills. We've got some old-style BeeBots at home, and this Robot Mouse, known as Colby, is a great upgrade with a few extra features which we'll write about in this review. I'll draw a few comparisons with BeeBot as many schools already have them and may want to consider an upgrade! Disclaimer: Learning Resources sent us a Code & Go Robot Mouse Activity Set to review. This is not a sponsored post and our views are always our own. 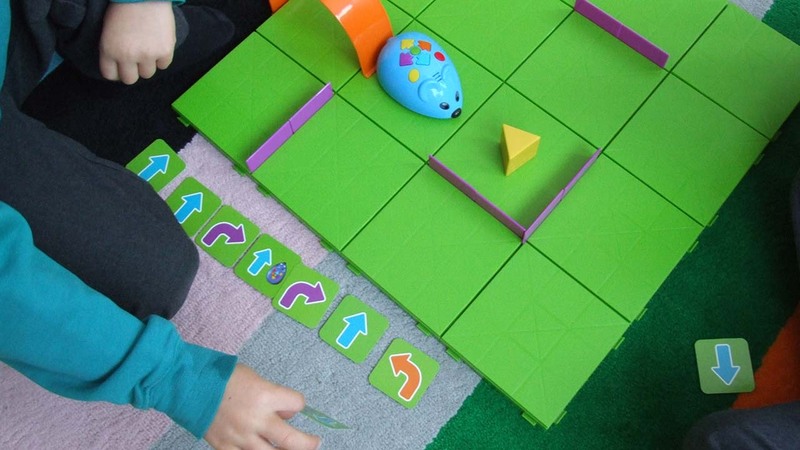 The Code & Go Robot Mouse activity set comes with 1 blue robot (mouse), 16 x green squares to make the board, purple plastic maze walls, orange bridges and a wedge of cheese. There's also lots of sequence cards and several double sided coding activity cards. Unfortunately the box, as nicely packaged as it is, isn't suitable for storage. We've come up with a plan to keep your activity kit together and safely stored away when not in use. 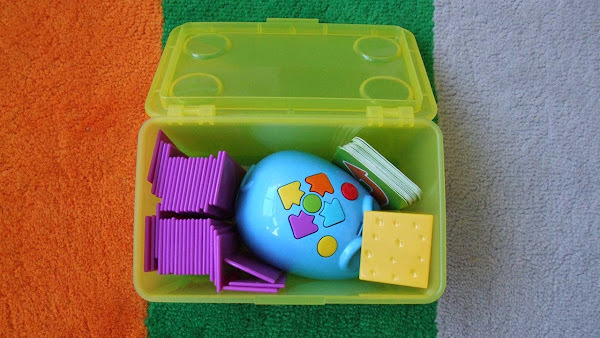 Colby, the maze walls, sequence cards and cheese fits perfectly into a small IKEA storage box (GLIS with a lid) and then everything else, plus this little box fits into the IKEA SAMLA 11 transparent box with lid. We're a little obsessed with keeping all our tech neatly stored away, ready for another time when kids want to play and learn. There's also a purple mouse, named Jack, which we love incidentally, but it's sold separately and you can't select an activity kit with a purple mouse! You'll get 30 more sequencing tiles with this programmable robot mouse. Why not have the option to choose one or the other in the kit? Does all robots have to be blue? You can use two mice with one activity set, by either racing them or getting children to help each other's mouse out with coding. The mice won't interact with each other. The Code & Go Kit doesn't require a tablet to work, and it needs 3 AAA batteries (rechargeables are fine), which aren't included. If your robot isn't quite making a 90 degree turn when left / right is pressed, it probably means you need new batteries. 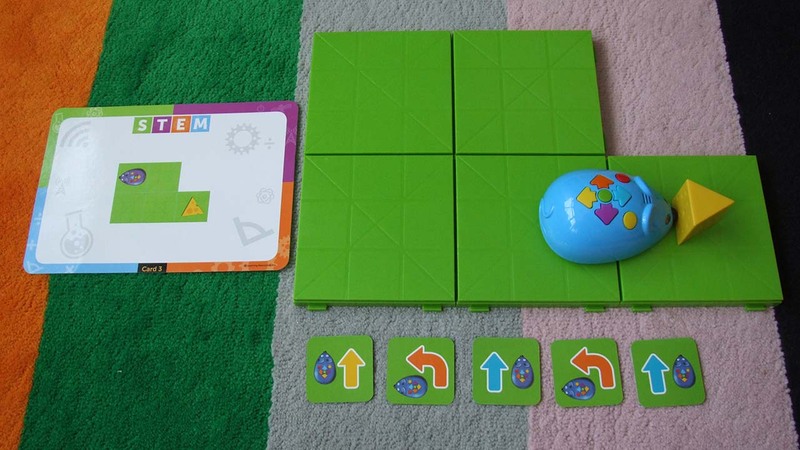 The coding activity cards included, means you can start playing immediately by following the pictorial instructions. My 6 and 8 year old put Colby through its paces and really liked all the cute squeaky mouse sounds. Colby's eyes also flashes blue when he finds his cheese. Even our dog Ruby was fascinated by this cute little mouse. Don't tell the kids - let them discover this. The cheese has a magnet inside and when Colby's nose touches it, he's activated to play a sound. My kids were very excited when they discovered this feature. Code Colby, by pressing the buttons on his body in a specific sequence and then press the middle green button to get Colby to move. The yellow button cancels everything, and the red button is to code an "action", which is shown as a lightning strike on the activity cards. It's a really good idea to get younger kids to use the sequencing cards to work out their code first and then programme it into Colby. It's easy to press the wrong button, which means you have to start from the beginning of the sequence again. Remember to press yellow to cancel! Colby operates exactly like a BeeBot. The only difference is the action button and the reed switch in his nose, to play the sound when he touches the cheese. I really like the maze. It's fantastic for developing spatial awareness and logical thinking skills. The maze can be built in a variety of ways using the 16 square tiles. If you look carefully, there is an easy and logical way to build, when you lay all the tiles in the same direction. It's a similar concept as Simbrix. The boys enjoyed building the maze just as much, if not more, as programming the robot mouse. You can either follow the activity cards or design your own. Use the maze walls to create traps and dead-ends and bridges to guide Colby in a certain direction. You don't have to only use Colby on the maze, the robot mouse can venture off on other floor types and homemade mazes - like the one we made for Ozobot. The robot mouse moves 12.5cm for every forward or backward movement - just in case you want to make your own! Why get Colby if we already have BeeBot? Well it, kinda depends what BeeBot you have. If you have an old style (yellow and black) BeeBot, you may enjoy an upgrade with Colby. There's a bit more you can do and the set comes with great resources. If, however you have the newer Blue-Bot, Colby may feel similar. The Blue-Bot does however require a connection with a iOS or Andriod tablet to access its full functionality. If you're looking for a screen-less introduction to coding concept for young kids - Code & Go Robot Mouse is a great option. 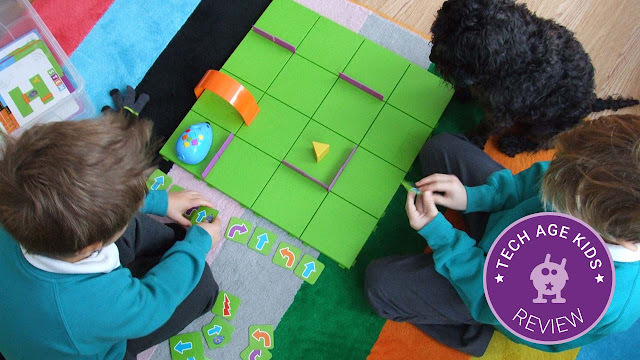 UPDATE 2018: Learning Resources launched a new coding robot called Botley - read our full review. This STEM kit and programmable robot is a brilliant choice for families looking for a screen-less toy that is educational and fun. Colby is endearing and can be used without the maze, which means a kid can code it anywhere (but maybe not outside in the dirt). Colby also is a fab upgrade choice for schools, looking to replace old-style BeeBots. Robot Mouse is recommended for ages 5-9, but we think it would be suitable for younger kids too. The basic coding concept are not far off from those learnt using Cubetto, which is recommended for ages 3+. I see that you posted that the robot mouse moves 12.5cm for every forward or backward movement. Can you provide the dimensions of the green squares?